In April, 1993, R&H Music, the BMI publishing division of The Rodgers & Hammerstein Organization, signed an agreement with Pulitzer and Tony Award winning lyricist Sheldon Harnick to be the exclusive representative for his entire catalogue through Mayerling Productions, Ltd.. Spanning a career of over 35 years, Mr. Harnick's body of work includes FIDDLER ON THE ROOF, FIORELLO! and SHE LOVES ME, as well as REX, THE ROTHSCHILDS, and his most recent works A CHRISTMAS CAROL and A WONDERFUL LIFE (the latter three of which are also available from The Rodgers & Hammerstein Theatre Library). Sheldon Harnick never aspired to be a writer on Broadway. "My ambitions were very modest," he admits. "I remember in seventh or eighth grade, we had to write a little essay on what we wanted to be. Mine said 'I don't know, but I love music, and I hope that whatever I do is, in some way, related to music.'" At the time, Harnick's main musical interest was the violin, not song lyrics - writing was just part of everyday life in the Harnick home. "Everybody in my family wrote, because my mother wrote. She celebrated every anniversary, every birthday, every occasion with a little poem. I used to write nonsense verse in grammar school, and into high school, which became lyrics when I met another person who was interested in that kind of thing."" This teenage friend introduced him to the world of community theatre, the two began writing song parodies and performing sketches, and eventually moved on to original songs. Harnick was drafted into the Army, and while assigned in Georgia, began performing with a special services unit. "I played violin solos at these events, and also played a few songs I'd written that were observations about the army life we were leading. That was a kind of revelation, because the more specific I was regarding a situation, the better the song worked. Sometimes lines I didn't realize were funny would cause great laughter. They were just things that disturbed me, and I would put them into lyric form." Harnick attended Northwestern University upon his release from the service, attracted by the school's outstanding violin faculty, as well as the professional standards of their student music revues. In his first year, he contributed only one original song to the revue, introduced by a then unknown Charlotte Rae. By his senior year he was writing half the material. Despite an encounter with a Chicago radio personality who tried to convince him that New York was the place for his talent, Harnick remained in the midwest, playing in dance bands as a professional violinist. When he developed a mysterious condition that left his hand so severely cramped he couldn't play, Harnick took his savings and moved to New York to try his skill as lyricist. He set himself a goal of completing one song a week, and began placing them in revues. Among these early achievements were "The Boston Beguine," with which Alice Ghostley brought down the house in NEW FACES OF 1952, "The Shape of Things" which Charlotte Rae introduced in THE LITTLEST REVUE, and "The Merry Minuet," which was recorded by The Kingston Trio. In 1957 he began working with composer Jerry Bock on THE BODY BEAUTIFUL, a musical about prizefighting. The show closed after two months, but brought the duo to the attention of Hal Prince. When Prince began work on FIORELLO! (1959), based on the life of New York's colorful Mayor LaGuardia, he took a chance on the young team. The show proved to be a long-running smash, garnering a Pulitzer Prize and sharing that year's top Tony Awards with THE SOUND OF MUSIC. Less than a year later, Bock and Harnick returned to Broadway with TENDERLOIN, a short-lived sarcastic tale set in the red light district of 1890's Manhattan. But it was their next show, the Hungarian romance SHE LOVES ME (1964), in which Harnick's work began to reveal new depth, partly as a result of psychotherapy. "For the first time," he recalls, "it was my own distinct personality, my own distinct voice." "I had thought that in my songs I was being witty and sophisticated and dry, as a Larry Hart would - I wasn't. I was using that approach so that I didn't have to deal with emotion. Hart, of course, is loaded with emotion, but my songs weren't. In FIORELLO! I started to write some songs that were more in touch with myself, but in many ways I think SHE LOVES ME is my first real show, because the analysis began to pay off. A line like ""My teeth ache from the urge to touch her"" was something that I had felt in the company of a pretty girl."" For Harnick and Bock's next collaboration, FIDDLER ON THE ROOF, Harnick drew heavily on experiences from his own youth, and his heritage. The emotional richness of the songs reinforced the central themes of generational conflict and changing traditions, carrying FIDDLER to worldwide success and acclaim. Winning virtually every 1965 Tony Award for which it was eligible, including Best Musical, FIDDLER enjoyed a record-breaking Broadway run of 3,242 performances. Three short plays set to music entitled THE APPLE TREE (1966), and the biographical tale of the famous banking family THE ROTHSCHILDS (1970) followed, both enjoying successful runs. In the 70's Harnick and Bock suffered a falling out, so Harnick turned his attention to translating operas and operettas (the Bock and Harnick split has been narrowing lately; they worked together on the recent Off-Broadway production of THE ROTHSCHILDS, and the current Broadway revival of SHE LOVES ME, and have discussed the possiblity of future projects, too). Towards the end of the 1970's he wrote the book, music and lyrics for DRAGONS, a radio drama (subsequently revised for stage) based on a Russian play. In 1976 he collaborated with Richard Rodgers on REX, based on the life of Henry VIII. 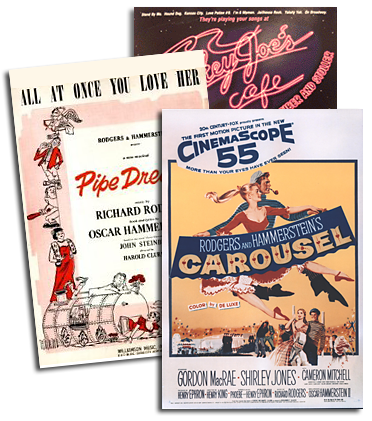 Although the Rodgers and Harnick score featured several beautiful songs, including the soaring love duet ""Away From You,"" the creators found themselves unable to create a sympathetic character from the notorious king. "The more I got into it," admits Harnick, "the more I realized I really didn't like Henry. I liked all of the wives." But even if the task of creating an effective theatrical piece around the monarch proved less than wholly successful, Harnick was thrilled to work with one of his idols. "I didn't know when I worked with Rodgers that I would fall in love with him." From modest aspirations to worldwide success, Sheldon Harnick has not only managed to maintain a humble perspective, but share it through his writing. Through songs such as ""Tradition,"" ""Do You Love Me?,"" ""In My Own Lifetime,"" and ""She Loves Me"" he has achieved the mark of true artistry - taking the personal and making it universal, while always speaking with a unique and individual creative voice. It's no wonder that R&H Music is proud to represent him. "I have felt a sheer love and admiration for his whole body of work since childhood," confesses R&H Music President Maxyne Lang. "There is an intelligence and a wit, and most importantly a deep love for humanity, that is pervasive throughout his works, from his oldest songs to his most contemporary pieces."